Provide comfort for the family of Dorothy Briggs with a meaningful gesture of sympathy. 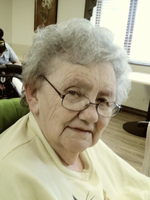 Dorothy E. Briggs, 78 of Ashland passed away, Sunday, February 3, 2019 in the Good Shepherd Skilled Nursing and Rehabilitation Center. She was born on July 16, 1940 in Fairmount, West Virginia to the late William and Ruby (nee McElfresh) Davis. She has been a homemaker all of her life. Throughout her life, she has enjoyed dancing at pow wows, camping, barbequing, and cooking; but most of all spending time with her family. Dorothy is survived by her husband, Robert M. Briggs of Ashland; two daughters, Tammy (Kenny Bagola) Kirkbride of Ashland and Tina (Barry) Pridemore of Wayne, West Virginia; four sons, Robert S. (Charlotte) Briggs of Medina, David (Carol) Kiser of Fondulac, Wisconsin; Paul Andrew Kiser of Glenmont, and Michael Kiser of Amherst; grandchildren, Cheyene (Travis) Behrendsen of Mansfield, Cody Kiser of Millersburg, Gregory Fulk of Ashland, Whalter and Ethan Briggs of Medina, Jennifer Mutchler of Brunswick, Savannah Kiser of Fondulac, Wisconsin, and several additional grandchildren; great grandchildren, Jenna and Dillon Pelfrey and Hunter and Scarlett Behrendsen; one brother, Paul (Nancy) Davis of Fairmount, West Virginia; and numerous nieces and nephews. and her fur baby, Pepper. Funeral services will be Thursday, February 7, 2019 at 11:00 a.m. in the Denbow-Gasche Funeral Home with Pastor Julie Thoms officiating. Interment will be in the Ohio Western Reserve National Cemetery. A meal and time of fellowship will follow the service in the Legacy Room of the funeral home. Friends may call Wednesday, February 6, 2019 from 4:00 p.m. to 7:00 p.m. in the funeral home. To send flowers in memory of Dorothy E. Briggs, please visit our Heartfelt Sympathies Store. Love, Lori and all of us up north! sent flowers to the family of Dorothy E. Briggs. Love, Lori and all of us up north! Please accept our most heartfelt sympathies for your loss.... our thoughts and prayers are with you and your family during this difficult time. Love, Lori and all of us up north! purchased flowers for the family of Dorothy Briggs.